Earlier this fall my weekly gaming group kicked off what’s estimated be a two-year-long Pathfinder Adventure campaign, The Mummy’s Mask. Since things have gotten a bit quiet here at MMOGC lately, I figured this blog could use some sprucing up with updates of our RPG exploits (especially ever since I took on record keeping duties for the group) so I hope you’ll enjoy reading about our shenanigans. However, if you plan on playing the Mummy’s Mask campaign, I suggest averting thine eyes now. Here there be spoilers. Most of the game screenshots you will see are from Fantasy Grounds which is a real nifty VTT program, which you can find more info on at their website or over at Steam if you’re interested. Thank you also to Paizo, the creators of the Pathfinder RPG and the Mummy’s Mask adventure path campaign. So without further ado, I give you the adventures of The Band of the Golden Sun! Weeks 1-3 will be posted first, with weeks 4 and 5 to follow later in the week, and then we should be all caught up. My thanks also to Pid, who is also posting these write-ups at his Random Encounters blog and helps me proofread these before they go live. The Band of the Golden Sun assembled before the Grand Mausoleum and the leaders of the followers of Pharasma anxiously awaiting assignment of their first location to explore within the necropolis of the City of Wati. Standing with a couple dozen other adventuring parties, the band listened to a brief history of the city of Wati and learned the rules for exploration of the necropolis. A banner with the party’s crest was hoisted into the air and a representative of the group obtained the adventurer’s assignment, the Tomb of Akhentepi. The following morning the troop ventured into the necropolis and found the tomb. The tomb entrance was half buried in sand and sealed with no handles. The group barbarian luckily had some tools and after a few minutes of shoveling the door was pried open with the help of a crowbar. The party entered the tomb only to find a large stone wheel barring their way. 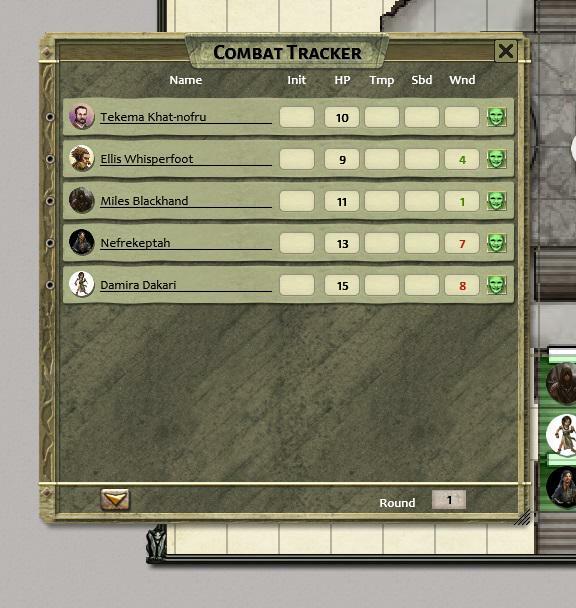 While the group focused on opening the stone door, the party Rogue was busy examining the ornate carvings in the tomb when he was attacked by a scorpion. 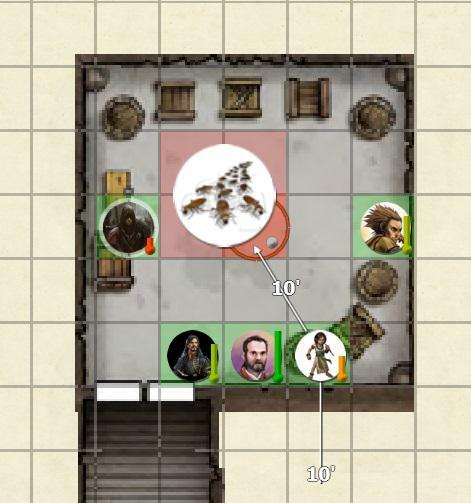 Succumbing to the venom of a scorpion sting, the rogue’s strength was sapped, but the group managed to dispatch the foe with the help of a mighty swing of the barbarian’s greatsword and ultimately opened the door with a group effort. Moving further into the tomb, the group found a 60′ deep shaft. The magus descended the shaft via a secured rope and examined the tomb floor. Unfortunately, the party rogue and cleric had difficulty climbing down the shaft and ultimately fell over 20′ nearly claiming their lives. A couple of cure spells from the cleric and the two were back up to fighting strength. The magus discovered the remains of a previous tomb raider and claimed two bottles of alchemist’s fire. After the barbarian descended successfully into the tomb, the party moved through the door in the chamber into a long hallway. Aware of the potential for traps, the party rogue moved in scanning the area with the party following closely behind. Unfortunately for all, the rogue missed a trap switch on the floor, and the party suffered the consequences. Hundreds of darts peppered the party and the rogue and magus took massive damage. The magus dropped to the ground bleeding out. The cleric channeled the power of his deity to bring the magus back from the brink of death. The party retreated to the previous room while the rogue proceeded to disable the trap making the path passable without risk of harm. The party moved into the next room to see what more they could uncover within the Tomb of Akhentepi. 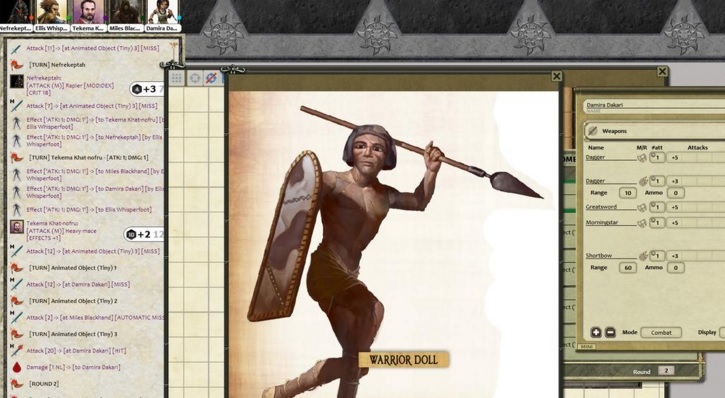 No, uh-uh, *I’m* the warrior doll. Recovering from their near-fatal encounter with the dart trap, the adventurers of the Band of the Golden Sun prepare to move deeper into the Tomb of Akhentepi. Meanwhile, the silent bard who has been following the party tumbles down the ladder to rejoin the rest of the group. They open the door to the western chamber and peer in. The room is a foyer of sorts, containing some general grave goods. The party moves on towards the south chamber, with the rogue checking for traps. They find a small flight of stairs descending to another set of doors. Inside this room is a magical mirror which the bard and the barbarian step up to inspect. The mirror turns out to be enchanted with some nasty spells; the bard howls as the word THIEF is branded on his forehead, while the barbarian leaps back to safety. Thinking quickly, the cleric hurls his hammer at the mirror and shatters it. The party heads east, into a room with an altar. Without warning, a couple of giant spiders spring up from behind it, and attack the adventurers. After a frenzied battle, with spider guts and blood flying everywhere, the party manages to dispatch the creatures, though the bard was grievously wounded during the encounter. He is thankfully stabilized and healed by the cleric before he could succumb to his injuries. The party decides to barricade themselves in this room in order to rest up and regain their strength. After their rest, the adventurers backtrack to the foyer, deciding to head through the doors to the north. A chest in the corner of this room catches their attention. The rogue attempts to unlock it, but unknowingly triggers a trap and a poisoned blade flies out and slices him in the arm. Shaking off the damage, he continues working and finally succeeds. Inside the chest are some books with gold plated pages along with three vials. It is decided that the heavy books can be left here for now, though the vials are divvied up, with the bard taking one cure light wounds potion, and the rogue taking the other one as well as the dark vision potion. The party ventures further into the room, where they find more potential treasures. Before they can look too closely, they are attacked by several small animated warrior dolls. After a short fight, the little figurines are vanquished, and the adventurers are able to investigate the rest of the chamber. They collect an assortment of valuable weapons. The cleric picks up a Scarab Shield, the bard picks up a short bow with a broken string, the barbarian picks up a khopesh, and the rogue picks up a spear. Looting through the chests in the room, they also find a good sum of money and a lot of old official documents. These documents are donated to the bard’s order for posterity. There is also old jar containing some perfume. This, the barbarian empties over her head to cover up the horrid stench of spider guts clinging to her skin. The adventurers return to the room to the south. They travel through the western doors, which lead to a crumbling staircase going down to another chamber. All of a sudden, the ground erupts from beneath the rogue’s feet, and the sand and dust around them coalesces into a sandling. The creature tears through the party, walloping several of its members senseless before it is finally brought down. A little worse for wear, the party continues down the stairs to the set of doors at the bottom. They go through and enter the next chamber, which has doorways leading off to the north, south, and west. The rogue checks the north door first, which is locked. He jimmies it open and steps through, finding more stairs going down and more doors. As they descend, their surroundings appear more and more lavish and ornate. They end up at a large octagonal room with a grand sarcophagus sitting on a raised platform at the center. The Band of the Golden Sun starts this off this week a little worse for wear. The adventurers enter the room with the sarcophagus. The magus steps on the platform to investigate further. As he does so, the four pillars surrounding the sarcophagus shoot out bolts of lightning, giving the magus quite a shock, in more ways than one! The sarcophagus then springs to life, bearing down on the party. As the adventurers engage the target, the security system triggered by the magus begins to take its course, the doors to the south slamming shut while torrents of water start pouring into the room through the northern doors. Ellis Whisperfoot, fancying himself a clever bard, leaps upon the sarcophagus and rides the thing like a gambling house whore. In his eagerness, he casts an unwitting spell which mends the animated coffin. Impervious to the bard’s actions and everyone’s collective facepalms, the sarcophagus continues to attack, even managing to encase the magus within its receptacle. All the while, the water level is rising, rising, rising. After a long struggle, the adventurers finally manage to bring down the hulking sarcophagus. The water ceases to rush into the room and levels off, allowing the party to search the area. The barbarian starts scraping the sarcophagus, collecting valuable scraps of gold from its decorated surface. The rest of the room, however, is conspicuously bare. The bard asserts his belief that this room along with its sarcophagus must have been constructed as a decoy, designed to lure unsuspecting tomb robbers to their watery graves. So after a night of rest, the party decides to forge onwards. Since the northern door here appears to be stuck, the adventurers head back to the room to the south, where doors to the west remain locked and unopened. The rogue jimmies these doors open and steps through. There is a corridor here, ending in a staircase leading down. The rogue also spots a secret door nestled in the northern wall. As everyone searches for a way to open this door, the barbarian heads down the stairs and disturbs a couple of mining beetles. The bugs are quickly crushed, and the party responds to a call from the bard, who has been exploring back in the sarcophagus room. Here he has discovered another secret door to the west. Miles works his skills on this door and manages to open it. These western doors lead to a small landing, with another hidden door! This one easily unlatches, opening to a rough tunnel. A hidden passageway! Alas, this just ends up anticlimactically linking up with the first secret door. The party backtracks to the landing, and takes the stairs to the north, which opens up into a chamber with a lot of chests containing a whole bunch of ancient, moth-eaten clothes. Other than a solid gold scarab clasp that the rogue found, there’s not much else of value. As the party divvies up some other items they found (a masterwork longbow with a wrecked string, two vials of silvery liquid, and ten cold iron arrows), it’s becoming clear that there should be more to this place, that perhaps the party has missed the main tomb. Suddenly, a swarm of roaches bursts forth from out of nowhere as the bard sets off a magical trap. As his companions stab, stomp and swat at the critters, the magus tosses in a couple bottles of alchemist’s fire, burning the roaches and his fellow adventurers both. Thankfully, the swarm is taken care of before the party can get themselves spectacularly killed in a raging inferno of their own making. They exit to the east through a secret door that they found after the skirmish. Damira attempts to throw her torch at an angry swarm of roaches. Sets own feet on fire. You are currently browsing the archives for the Pathfinder RPG category.